I compare ingredients in pet food, I found the ingredients in Kirkland cat food, compares to the higher priced custom premium foods at the price of the lower quality foods. I have no problems feeding this to my pets. This food is great for my cats. They seem to like it and they didn't seem to show any problem (intolerance, allergy, itch, loss of hair, upset stomach, name them) since I switched to it. The reason why I started buying it is that my dog eats the same brand and I didn't notice any problem with her. Pros : The price is really great and the ingredients are better than some overpriced big brands. Kirkland always offers good products for an excellent price. You also have the choice between the regular food or the light one, which is good for indoor cats. Cons : They only offer 1 flavour. Also, the bites are very small, which is not a really good thing for keeping the teeth clean, according to veterinarians. Do they always tell the truth or do they wanna sell us their overpriced food? Maybe both, but the bites could be bigger here, in my opinion. Flavor Selection Only one flavour. You can pick regular or light, though. A low priced high quality cat food. This food is a great choice for your cats. 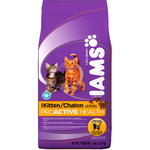 It has high quality ingredients without any fillers like by-products, wheat, corn or artificial colors, and is priced well below other foods of similar quality, All five of our cats eat this food exclusively without complaint, and they are all at a healthy weight with shiny coats and no health problems. Quality of Ingredients This food isn't the highest in terms of ingredient quality, but it is pretty decent, probably in the top 15-20%. It could be higher quality, maybe grain free or organic, but considering the price it's a pretty great food at an amazing price. If you were to buy a similarly priced food from a pet store or grocery store you would get a food filled with by-products, corn, wheat, soy, dairy, and artificial colors. This food has none of that. Flavor Selection I believe this cat food only comes in one flavor-chicken and rice, but it seems to be well liked by every cat I've fed so I think that the majority of cats will eat this flavor. I have 15 cats that I feed, and they all love it. I have been using Kirkland for the past 4 years for indoor cats and outdoor feral cats. My fifteen indoor cats love it, and prefer it over most other brands. Although, other brands have caused allergic reactions with some of the cats, I find that Kirkland does not. It is surprising, that, such a nutritious and flavorful cat food can be so economical. The ten, or so, feral cats ( occasional raccoons and opossums ) that I feed, seem to enjoy it. It is easier to store, stays fresher longer and attracts less flies, in the summertime. I have a small sanctuary with 7 cats 5 of which are special needs. I started feeding costco cat food 2 months ago and have had fabulous results. The chubby cat is a bit leaner all the cats coats are wonderful. The one amazing side effect of this food is.. One cat has allergies and has licked the fur off her legs and tummy for years even though we give her allergy meds etc.. vet visits... and she has been on only high quality, organic, costly food for cats with allergies etc. She has STOPPED licking her fur off, she now has fur growing back in on her tummy and her legs no longer have bare spots, I am completely amazed and the ONLY thing is I switched to this cat food. ( reason: recommended by another cat rescue) Yes some of the cats have thinned down but I now mix the regular costco cat food with the healthy weight one and that seems to do the trick. Now all cats are lean and coats are shinny and the black cat now has hair again. I would definately recommend this food. If your cats are leaner than you think they should be check with your vet or mix them as I do. I am so grateful that there is a brand of cat food out there that is good quality that does not cost me over 2.00 lb for dry. in 10 lb. bags. Kirkland Signature is the only crunchies for our family's cats! Cats are carnivores. Why do so many cat foods seem to be nothing but corn meal? Kirkland has the best ingredients--better than Iam's--at the best value. My three cats and my dad's two as well only get Kirkland for their dry food. The cats are very healthy, and their coats are soft and glossy. The cats love it. In fact, I can't so much as leave a bag unattended in my house for 2 minutes, or my lynx point will chew through the bag and crawl in. 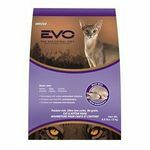 I purchased this natural cat food with no dyes when the price of my regular brand went throught the roof. It was well received with my 2 youngest cats. However, my 2 older cats still prefer the food they were raised on. So when it comes to feeding time, I just put out 2 big bowls of both kinds of food. The cats have their choice and everyone is happy. I'm happy too because I am saving money. I bought the Kirkland Signature Super Premium Maintenance Cat Formula for my 2 1/2 year old cat after having nothing but great things to say about the dog foods that we use for our three pups. When we first brought this food home, we mixed it with our kitty's remaining food so that the transition would not be as noticed by our little guy. However, he recognized the new food right away and decided he did not like it. He would eat around the Kirkland food, and meow once he was done with his 'picking'. The next day, he gave in to hunger and began to eat it. All I can say is that it STINKS! Whenever he eats, I can smell the fishy smell across the living room. I can only imagine how it tastes to him. I mix in treats and other foods since I can tell he doesn't care for the food. On the upside, as a kitty mommy, the ingredient list is good. The first ingredients are meat, which is good, so it's not full of cheap fillers. Kirkland just needs to reformulate this food so that our four-legged friends like the taste, and so that we don't have to plug our noses every time our cat eats it. 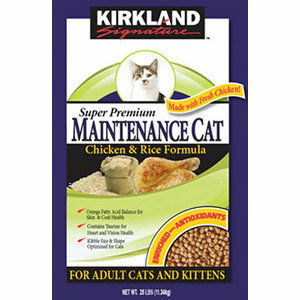 Kirkland Maintenance Cat Food rocked my cats socks off!! We live on a farm and have accumulated quite the collection of farm cats, and a couple indoor cats as well. I have two picky eaters, and both eat this stuff like it's going out of style!! (I should say they eat it whenever it is offered to them... but I am able to feed smaller portions due to the higher quality ingredients, and higher protein levels.) I'm actually saving money by purchasing Kirkland Maintenance Cat. 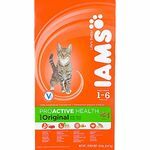 This cat food is excellent, and makes me feel like I'm doing a good thing for my cat's health every time I purchase a bag. Highly reccomended! Kirkland Cat Food is an economically sound choice. When shopping for a dry food for our adult cat, we decided to look for a formula that did not have added artificial colors. One reason for this was that it would make any cat vomit easier to clean out of our rugs! This might seem gross, but we were trying to be rational. Kirkland Signature Supreme Premium Maintenace Cat Formula is an economically sound choice for a dry cat food without any additional artificial food colors. There certainly are other, more expensive brands that likely have a higher content of protein than this kibble choice. However, for us, this cat food makes sense. 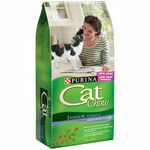 Our cat enjoys this food, and she tolerates it without any gastrointestinal issues. In fact, when the dogs are near the cat's bowl, they also like to get a taste of this food! 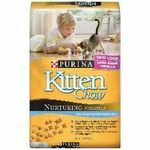 Another nice feature of this dry cat food is that it is readily available and is available in a large bag, so we never seem to run out of food for our cat.